Why is Japan's public diplomacy so utterly inept? So what’s with Japan’s public diplomacy? Why does it keep drawing attention to wartime Japan when the world is far more interested in 21st century Japan? The latest inept gambit was the Foreign Ministry’s decision to file an amicus curiae (official brief) on Feb. 22 in support of a lawsuit that seeks the removal of a “comfort woman” statue in the town of Glendale, California. The Californian state and federal courts ruled in favor of the town, but an appeal of the federal court ruling has been made to the U.S. Supreme Court to overturn that decision and force Glendale to remove the statue. The chances of the Supreme Court considering this appeal are remote — typically only about 1 percent of such cases are selected — so why did the Foreign Ministry go to the trouble and expense of weighing in on this particular lost cause? What are the chances that targeting local U.S. authorities for challenging revisionist denials and evasions about the comfort women will serve the nation’s interests? Refining America’s understanding of what went on with the comfort women has become a preoccupation of Japan’s diplomats during Shinzo Abe’s reign as prime minister. The envoys are apoplectic about statues commemorating this system of sexual servitude — a system that the Japanese government acknowledges existed. In a surreal news conference following the impeachment of South Korean President Park Geun-hye, Japanese Chief Cabinet Secretary Yoshihide Suga insisted that the government in Seoul and Park’s successor abide by the 2015 comfort women agreement. Curiously, getting the statues sorted trumped responding to North Korean missile tests and preserving the 2016 bilateral military intelligence-sharing pact. 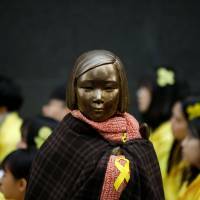 I wouldn’t be writing about the comfort women statues around the world if Japan’s revisionist pundits, activists and officials didn’t keep drawing attention to them. But under Prime Minister Abe, the recrudescence of a sanctimonious nationalism has ignited culture wars at home and memory wars overseas. The bronze statues make an indelible statement that complicates the task of erasing the memory of what was inflicted on and endured by these women. The Foreign Ministry had Hogan Lovells, a lobbying firm that Japan has long relied on to navigate the networks of Washington power politics, prepare the legal brief in support of the Glendale lawsuit. The media reported that this firm was also behind the establishment of Voices of Vietnam, an “astroturf” (fake grassroots) organization that appeared out of nowhere to lambaste South Korea over the plight of women who provided sexual services to its soldiers when they were fighting in the Vietnam War. Former Minnesota Sen. Norm Coleman was hired as point man for this group, demanding an apology from President Park on the eve of her 2015 meeting with then-U.S. President Barack Obama in Washington. This is how Japan is playing hardball in its public diplomacy — relying on “hired guns” to do the dirty work. The original plaintiff in the Glendale case passed away, but Koichi Mera stepped forward to pursue the appeal. He is president of the Global Alliance for Historical Truth (GAHT), a U.S.-registered corporation that distributed two books in 2015 to Japanologists all over the world, polemical jeremiads that exposed the flimsiness of revisionist posturing. One of those books — “History Wars, Japan — False Indictment of the Century” — is a Sankei publication, suggesting some connection between the right-wing media conglomerate and GAHT. “History Wars” argues that the U.S. is the crucial battleground, but its whitewashing tactics are ill-suited to the terrain and doomed to failure. With the Foreign Ministry taking up the legal cudgels for a lawsuit being appealed by GAHT, it is now openly associating with groups committed to beautifying Japan’s wartime past. In the 1990s, Japan embraced a positive diplomacy of reconciliation toward Asia. Across much of the political spectrum there was a consensus that it was time to end Japan’s selective amnesia and promote a forthright reckoning. This remorse has given way to a self-righteous and condescending stance towards Japan’s victims, as is evident in the revisionist camp’s efforts to assert an exculpatory narrative that is sparking a backlash. The statue installations are a response to this revisionist whitewashing. The Foreign Ministry justifies supporting the Glendale case as a way of making the government’s views on the comfort women issue known overseas. 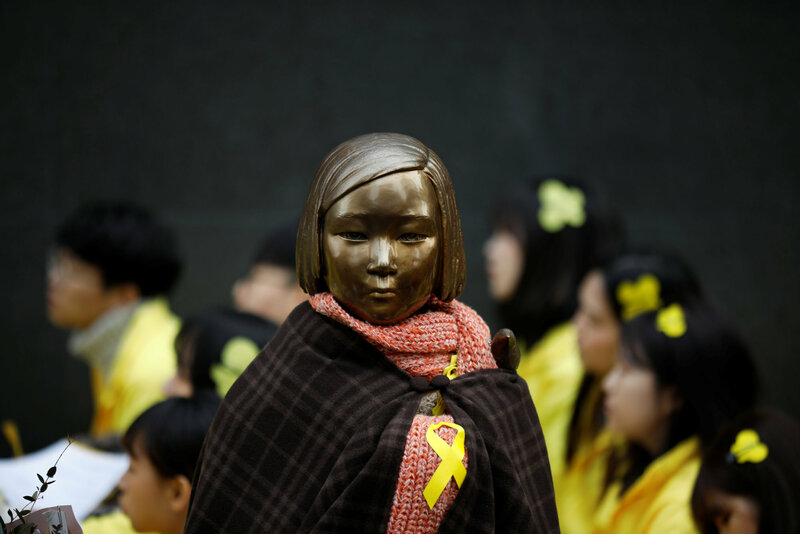 It argues that installation of the statue is not consistent with the spirit of the 2015 comfort women agreement between Seoul and Tokyo, which was supported by the U.S. But the statue was installed in 2013 and nothing in that 2015 agreement commits the U.S. or its citizens or local governments to refrain from commemorating the comfort women’s painful saga. The Foreign Ministry accuses South Korea of violating the agreement and has withdrawn Japan’s ambassador over the placement of another comfort women statue, this one across from the Japanese consulate in Busan. The ministry is incensed that a similar statue remains across from the Japanese Embassy in Seoul, because it believes the 2015 agreement commits Seoul to its removal. In fact, the pact only commits the government to “solve this issue in an appropriate manner” by consulting with relevant organizations. Is there evidence that it has not done so? South Korea’s Foreign Ministry has thrice officially asked the Busan authorities to remove the statue, and has stated that the statue in Seoul should also be removed. By weighing in on the Glendale case, the Japanese government appears to be violating the pact, under which both governments agreed to refrain from giving each other a hard time over this issue internationally. By supporting an appeal to the U.S. Supreme Court regarding the comfort women, hasn’t the Foreign Ministry crossed that line? The ministry’s brief contends that U.S. law prohibits local governments from interfering with or defying the national government’s foreign policy, and that Glendale has violated that constitutional provision by installing a statue. That argument did not stand up to judicial scrutiny because it is baseless, and judges ruled that forcing the removal of the statue would infringe on freedom of expression. Next up is San Francisco, where this autumn another comfort women memorial will be erected. There, too, local politicians were subjected to hardball pressure tactics and an orchestrated campaign against the memorial that reflect badly on brand Japan. Shouldn’t public diplomacy work toward improving Japan’s image? In the history wars now being waged by Tokyo, this goal is being sacrificed on the altar of revisionism.